Shared private driveway on the south side of 78th Street, sort of where Denyse Lane used to be. 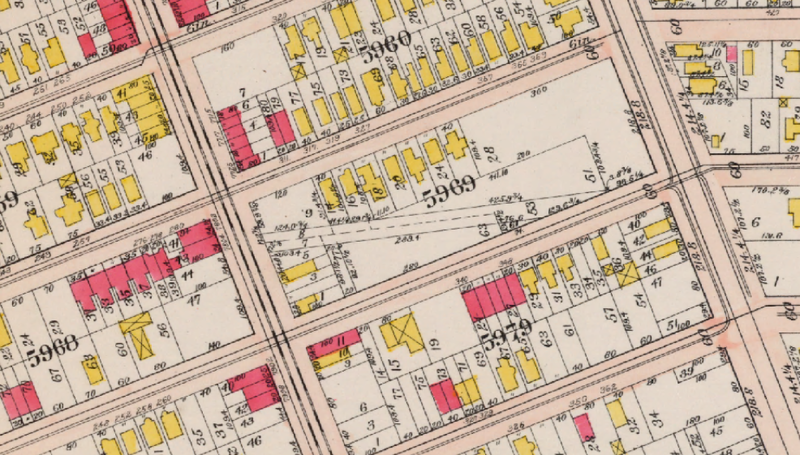 One of the oldest streets in Bay Ridge disappeared more than 100 years ago—or did it? Can you almost find its vestiges today, in the way the houses around its former location were developed? Denyse Lane was one of the old Bay Ridge roads, laid down before the street grid was imposed on rambling farmlands and irregularly cut estates. It ran from Yellow Hook to New Utrecht—or, roughly, Bay Ridge to Bensonhurst—basically picking up where Van Brunt Lane left off, running east from Third Avenue, just south of present-day 78th Street, until it met “the Kings Highway,” aka the State Road (not to be confused with what we today call King’s Highway), another of these old serpentine roads, at Eleventh Avenue and about 81st Street. 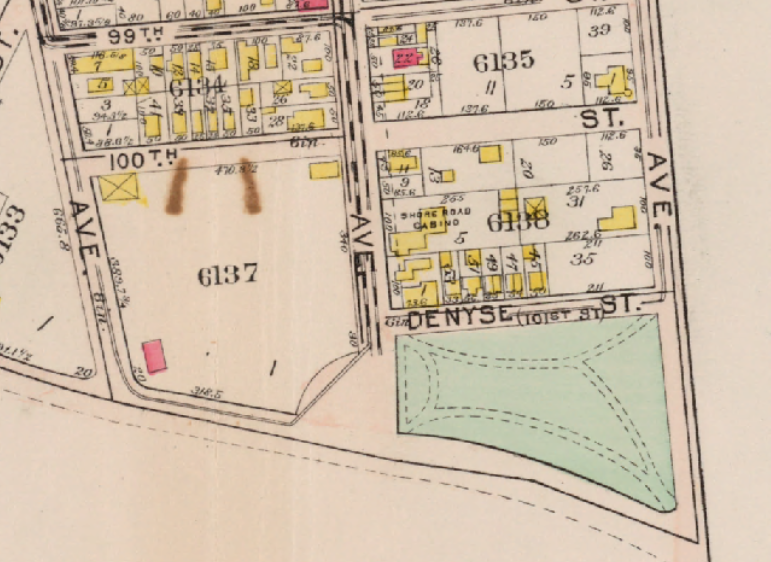 101st Street was called Denyse Street as late as 1907, and Denyse Denyse’s daughter Jane Smith donated the land onto which St. John’s church was built in the 1830s. The large apartment building at 601 79th Street is called The Denyse, after Peter. 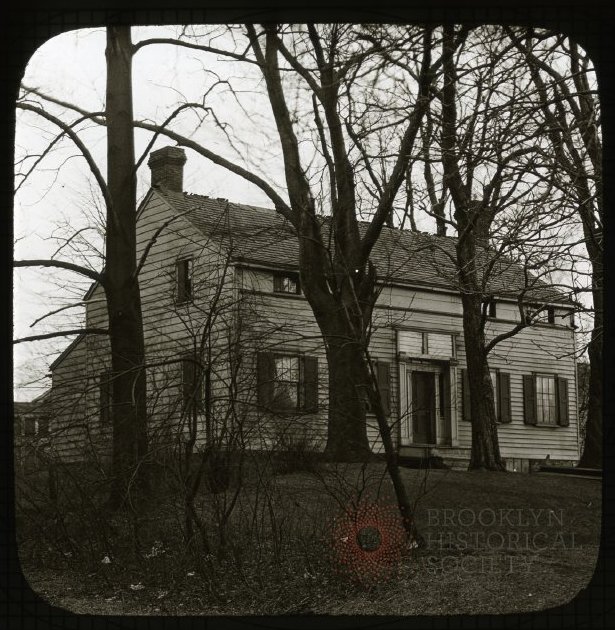 “Peter Denyse lived on DeNyse Lane above Stewart Ave., now the S. E. corner of 6th Ave. and 78th St.,” a nostalgic William Gollhofer wrote to the Brooklyn Eagle in February 1942. “He lived to be 100 years young plus two months. I was at his 100th birthday party. A wonderful man. Pneumonia got him two months later. 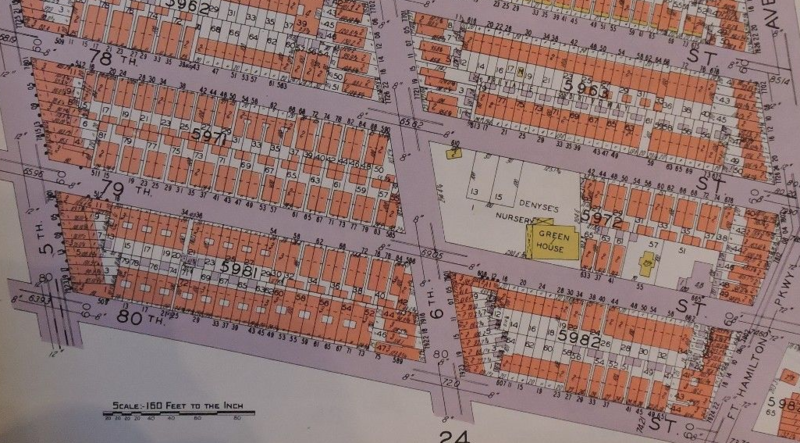 He was born and lived in Bay Ridge 100 years.” At least as late as 1928, “Denyse’s Nursery” still occupied the corner of 79th and Sixth, including a relatively large greenhouse. 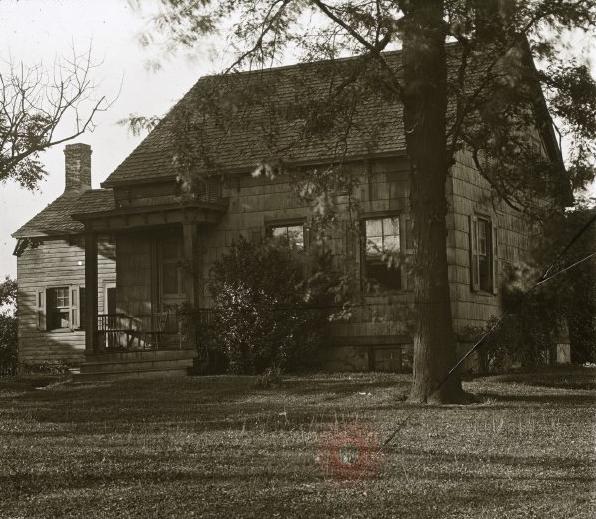 Within the last decade or two many changes have come upon the old town folks of New Utrecht. The descendants of the phlegmatic but shrewd early Dutch settlers have at length been induced to part, for large considerations, with highly prized farms. The real estate speculator and boomer has entered upon the scene, has cut up the farm into building lots and villa plots and has laid out the streets and avenues according to the town survey commission map, and the old romantic lanes and ancient highways have gradually disappeared. 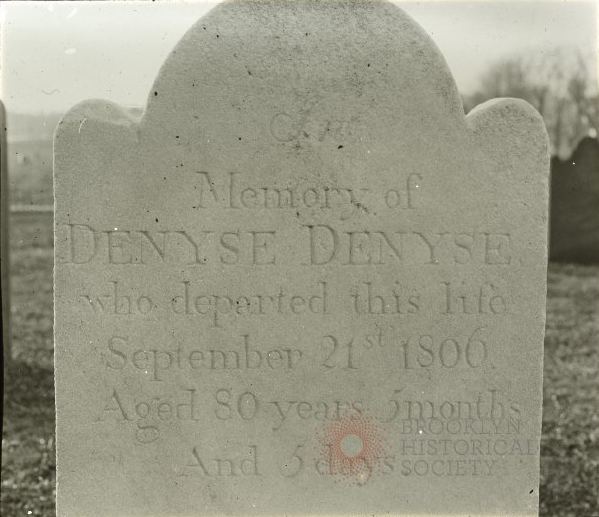 Denyse’s lane was long ago abandoned and the land which formed the bed of it absorbed into the adjoining lots. The entire road, from Third Avenue to the King’s Highway, was officially closed by law in 1897. But it lived on longer, appearing on maps as late as 1907, and it seems to me that traces of it survived. 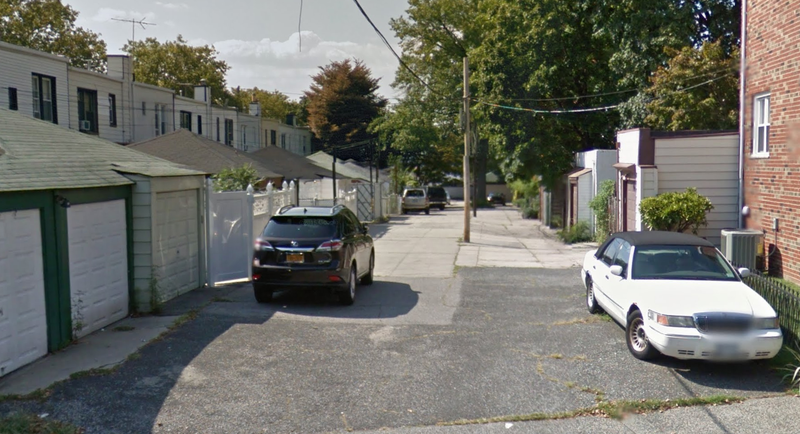 For example, many blocks in Bay Ridge have long shared driveways behind attached houses, but the block surrounded by 78th and 79th streets, Third and Fourth avenues, through which Denyse Lane once crookedly jutted, has three, more than any other street in Bay Ridge, as though the developers of these lots respected the popular old road that once ran there and preserved its essence. 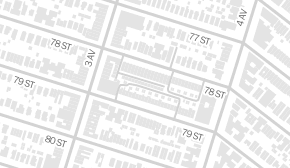 Almost the entire block, on both sides, has what’s essentially one big private lane running through it—which lets out on the 79th Street side just about where Denyse Lane would have! Look at all those driveways! 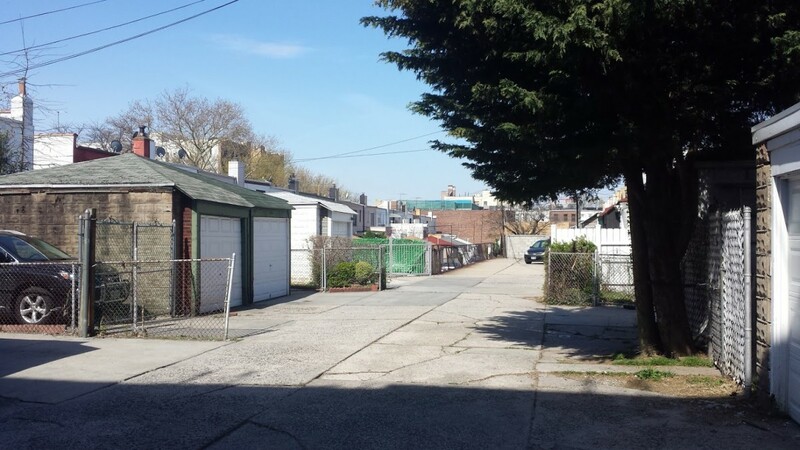 And where Denyse Lane once would have emptied onto Seventh Avenue, between 78th and 77th streets, today another private shared driveway behind attached houses also empties out. I can’t say for sure that Denyse Lane influenced the building of these alleyways, but it seems to me unlikely that they just happen to align so closely and copiously with its former route. But maybe it is mere coincidence. Or maybe it’s what Luc Sante, in his book The Other Paris, calls “the mystical phenomenon of unexplained recurrence. ‘There is always a certain public square or a certain intersection that, through mysterious and providential forces, seems forever devoted to a single specialty,’ wrote a mid-nineteenth-century chronicler. ‘I don’t know what secret instinct impels the same classes or the same professions always toward the same places. Thieves, pickpockets, beggars, streetwalkers, street performers have still not left the haunts they have inhabited since the Middle Ages.” Perhaps the same is true of moving things—they trace and retrace the same pathways, even when governments build them new ones. “[79th] street,” she writes, “from the Shore Road to New Utrecht village limits [in present-day Bensonhurst], has been made into a broad city street. Gone are all the pretty wooded sections, the little pond, the ‘Lanes,’ etc…. “This became an area for homes of city people who wished a taste of country,” she adds, as new streets were cut through old farmlands. Today you don’t even get a taste of the country—just, maybe, suburbia, where driveways for cars replaced country lanes for people. Popular 1873 Comstock map (detail). Denyse Lane at center. How Did Bay Ridge Vote in the Presidential Primary?